It’s time to cut the sprites, click on the Sprites image, and edit it in the inspector tap at right. Then use the automatic slicer to cut the 2D sprites and apply the changes. We need to create 5 empty objects, to maintain the order in the scene; click on GameObject -> Create Empty, the object will be background, player, pipes, camera and floor, after that drag the Main Camera inside the Camera Object. It’s time to set the camera pixels, Click on File->Build Settings then Choose Android and click on Switch Platform; you need the Android SDK, if you don’t have it please follow this instructions before you switch http://docs.unity3d.com/Manual/android-sdksetup.html. It’s time to create the floor, let’s do the same as the Background, click on the Sprites image and open it, then select sprites_5 and drag it inside the Scene Tab, go to the inspector window and change de X and Y to 0,-4.65 and change the name to BrownFloor, drag the BrownFloor inside the Floor Object, then duplicate the BrownFloor to make a scrolling floor, right click on the BrownFloor Object select Duplicate, go to the inspector window and change de X to 6.8 and change the name to BrownFloor 2, in the end change the spriteRenderer change the Order in Layer to 1 in both objects. 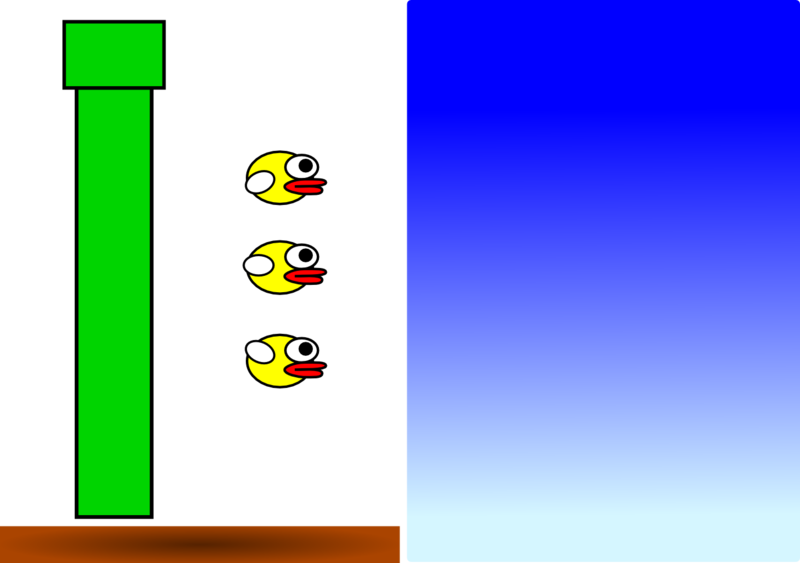 Time to make the Flappy Fly, select the Assets Folder in the project tab and create the folder “Animations” then click in the img folder, select the sprite_1 then press CTRL and select sprite_3 and sprite_4, drag them inside the Scene Tab, find the Animations folder and open it and save the animation as FlappyBird, change the name in the hierarchy tab to FlappyBird and drag it inside the player object. In the inspector tab change the X position of the FlappyBird object to 0, if you click Play you’ll see the Flappy Bird flying, we can smooth the animation in unity 4.6, to do that we need the animation tab, go to Window -> Animation, click in the animation tab, then select the FlappyBird object in the hierarchy tab, you’ll see 3 rhombus with 2D images, select the sprite_3 in the img folder and drag it to the animation, next to the last rhomb, then click the rec button above the animation to stop editing the animation, click play to see the results.